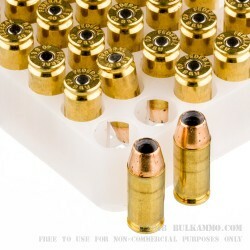 A great single SKU item for the .40 S&W shooters that want a single round for everything. It’s a very potent self-defense round with an unassuming box and a strong presence at the range. Accurate, reliable and ready for legitimate duty, this .40S&W is a 1000 foot per second speed, with 400 ft. lbs. of energy round, without having to remind you every time you look at it. Pricier than standard range rounds, a bargain compared to ultra-premiums, this is a perfect bridge ammo for those who aren’t quite sold on the ultra-premium offerings being that much better at threat stopping than the premium rounds – the group to which this round belongs. Reloadable brass cases make this a good vale for the brass hoarder or load tinkerer. Reliable historical performance makes this a great value for those who just want to hear their favorite pistol go bang every time when they are at the range. Excellent proven stopping power and high overall quality control means this round is going to work when you need it to because your life depends on it. Sold in a 1000 round case because when you have a round that can be used for everything you do with a specific caliber, it’s good to get a bulk ammunition discount. 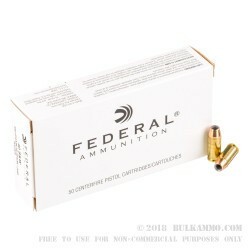 Good ammo, Good price, Good service. 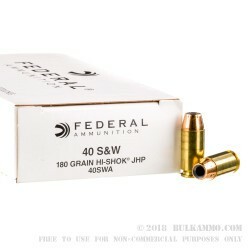 Q: Can the federal 40 sw ammo brass be reused for relaoding? A: Yes, this Federal .40 S&W brass can be used for reloading. It is high quality brass and will last for quite a while if reloaded properly. Q: My question comes from a conversation I was having with a buddy of mine on defensive ammo vs FMJ ammo. 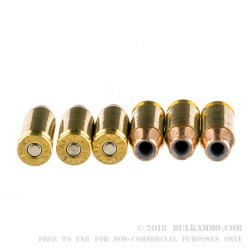 With FMJ having better penetration power and hollow point defensive having superior stopping power with it mushrooming, would it make sense to put both rounds in a single magazine for personal defense (e.g. Stager every other bullet between FMJ and defense round in a single magazine)? My argument to add FMJ is if someone is wearing extremely thick clothing or even behind cover, the defensive round may not penetrate. A: In .40 S&W, there is no concern about JHP ammunition failing to penetrate heavy clothing. At worst, it will fail to expand, and then will perform almost exactly as an FMJ projectile would in that instance. As for cover, the difference between FMJ and JHP is also small - either it will penetrate the barrier, or it won't, with most handgun rounds generally being poor in comparison to most rifle rounds. One exception to that in certain instances is auto glass, but again, with handgun ammunition, the difference between FMJ and JHP there is small. Beyond that, if the loads were staggered, there is no guarantee that the projectile exiting the muzzle would meet the conditions in which it would perform slightly better, be it cover, clothing or soft tissue. The greater potential for FMJ penetration through a large amount of soft tissue with enough retained velocity to cause damage to property or life beyond the intended target would seem to be of greater concern - from a liability standpoint, if nothing else. Q: I like to shoot the same round I carry. These are priced low enough to actually shoot as opposed to some of the "premium" rounds. Will these reliably expand fired from short barreled carry guns (Glock 27). A: Although we have confidence in this bullet for self defense purposes, we were unable to find reliable ballistic gelatin performance data for this round out of short barreled handguns. However, there are similarly priced offerings from Federal that we do have data for and can confidently state will expand out of short barreled pistols - take a look at the HST bullet.